Karen Anthony is a member of the Biochemical Outcome Measures (BOM) working group. Karen studied biochemistry at the University of Leeds during which time she spent one year as a sandwich student at GlaxoSmithKline (GSK). During her PhD at King’s College London she studied the RNA processing of the microtubule-associated protein, tau and aberrant RNA processing in neurodegeneration. In 2010 Karen translated her RNA expertise to the neuromuscular field and moved to the Dubowitz Neuromuscular Centre, Institute of Child Health, University College London (UCL). Working with Professor Francesco Muntoni, Karen played a key role in developing antisense oligonucleotide-mediated exon skipping as a therapeutic strategy for Duchenne muscular dystrophy (DMD). Karen’s pre-clinical and clinical work in this area is helping to expedite the translation of exon skipping candidate drugs to the clinic. 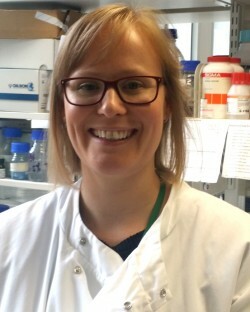 Karen moved to the University of Northampton in 2015 as a lecturer in molecular bioscience where she is continuing her research activities on RNA processing and RNA therapeutics for neurological disorders.